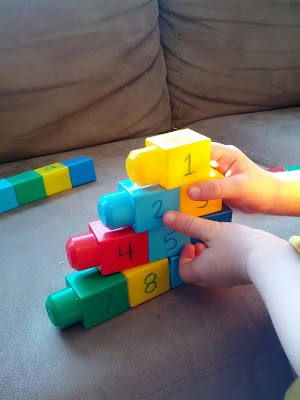 After the success of the alphabet Mega Blocks, in my mind, it only made sense to make number ones as well. 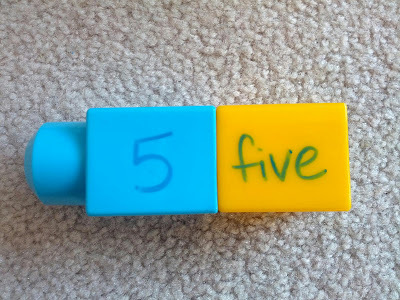 When I made the alphabet ones, I found that the window markers worked better than the dry erase ones. So I used window markers for these number ones as well. They dry quickly and don't rub off like the dry erase markers do. And after many days, they still cleaned up super quick with just a damp cloth. These literally take just a few minutes to make and aren't as time consuming as they may appear. Originally, I did the numbers 1-20. 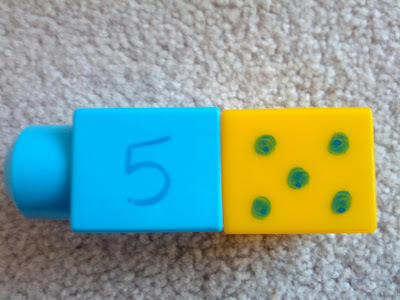 I also did the written form for the numbers 1-10 and drew corresponding dots for the numbers 1-10. 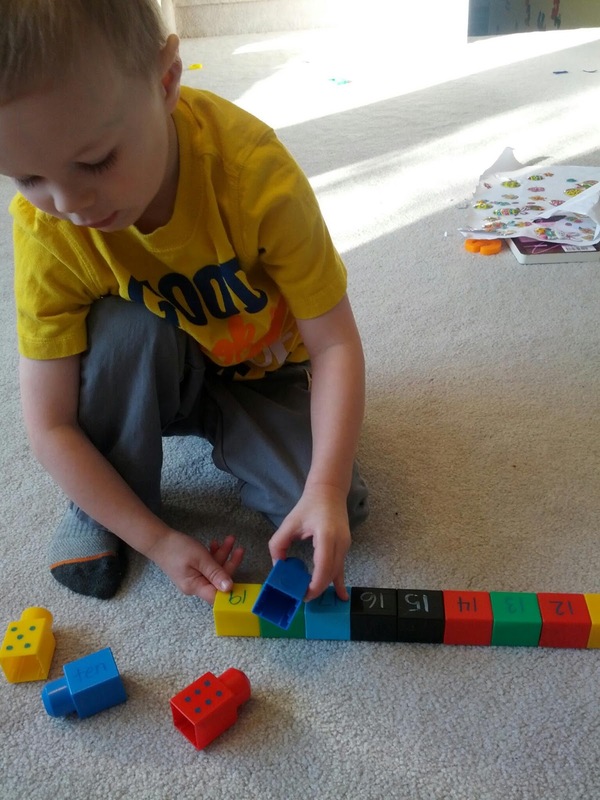 Consequently, these blocks could be put together in a variety of ways. 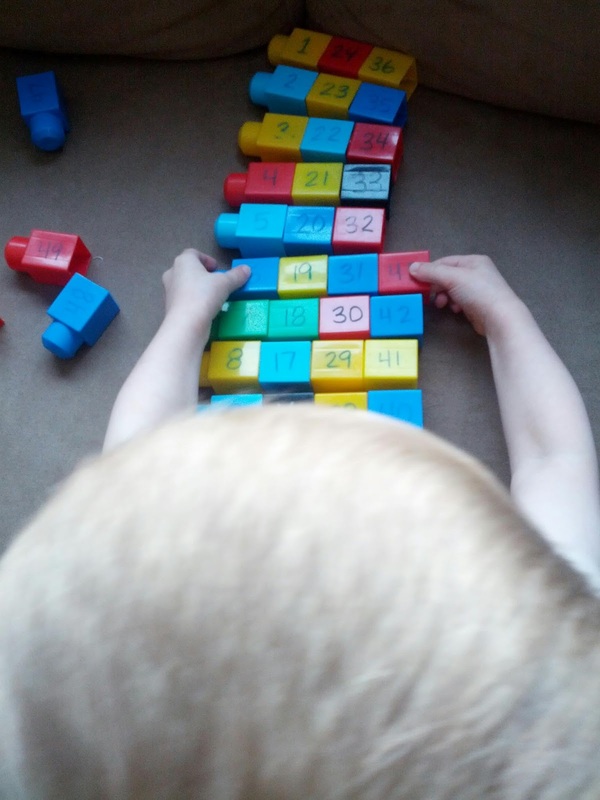 However, as you will see, J chose to play primarily with the numeral form. So I quickly made up the rest of the numbers from 21-50. 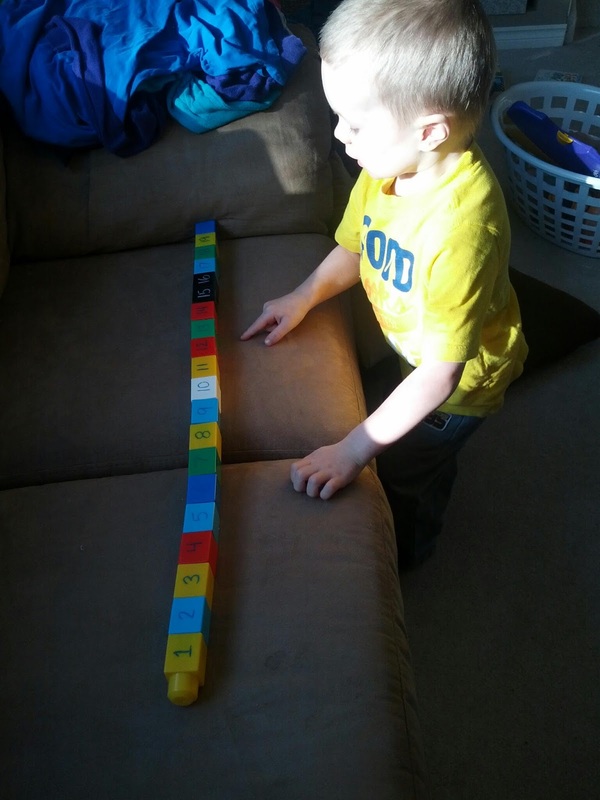 He probably would have loved to have the numbers all the way up to 100, but I don't think I have enough blocks for that. Anyway, you can definitely tailor these blocks to your child's age and skill level. I quickly made these for J while K was napping, so I handed him the bin and asked him if he wanted to check them out. They had numbers on them, so of course he couldn't resist! 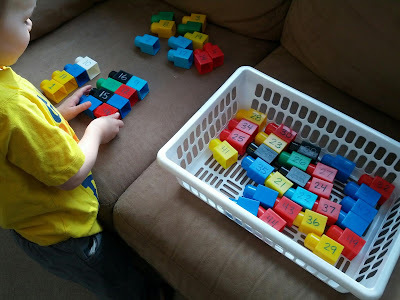 As I already mentioned, these blocks could be played with in a variety of ways. Count the number of dots and find the matching numeral form. Matching the numeral form with the corresponding number of dots. 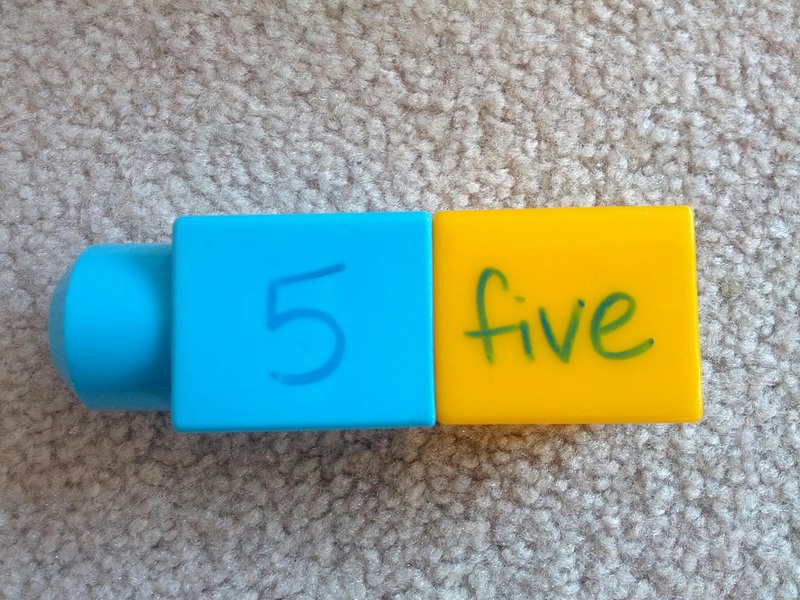 If you child can already read or is practicing their reading, encourage them to match the written word with the corresponding number. 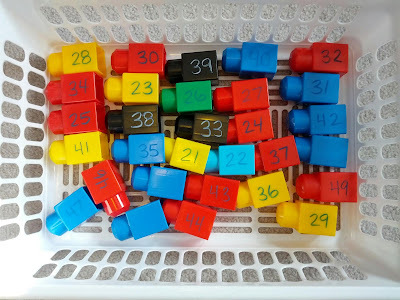 Matching the numeral form with the written form. Count the dots. Match it to the correct number and written form. Matching all three types together. 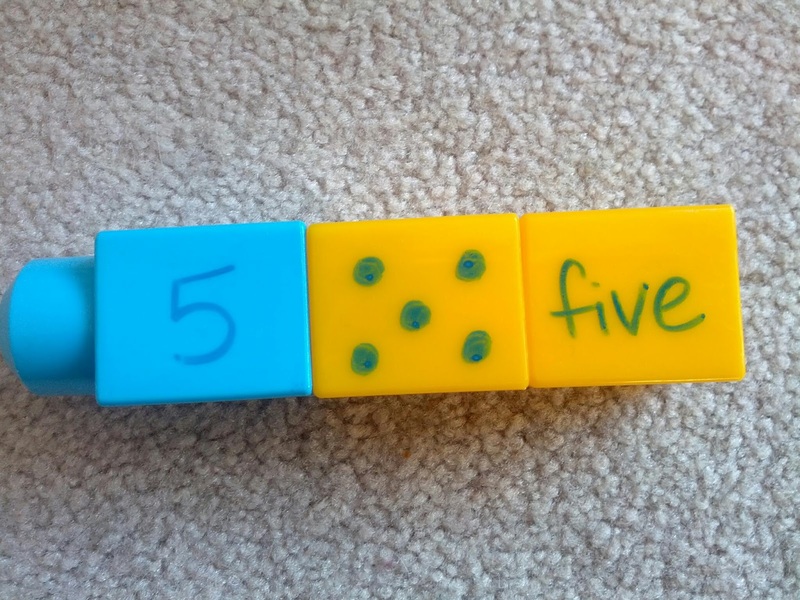 Count the dots and match with the written word. 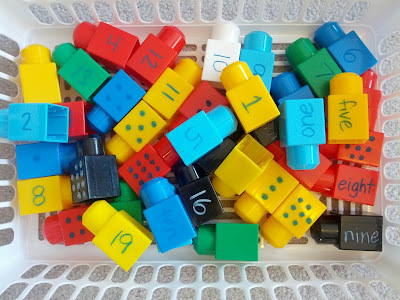 You could label the blocks with the numbers 0-9 and make two complete sets. Then you can encourage your child to count all the way up to 100 by linking the blocks together to form double digit numbers. Have your child put the numbers in order from 1-20 (or whatever number you go up to). 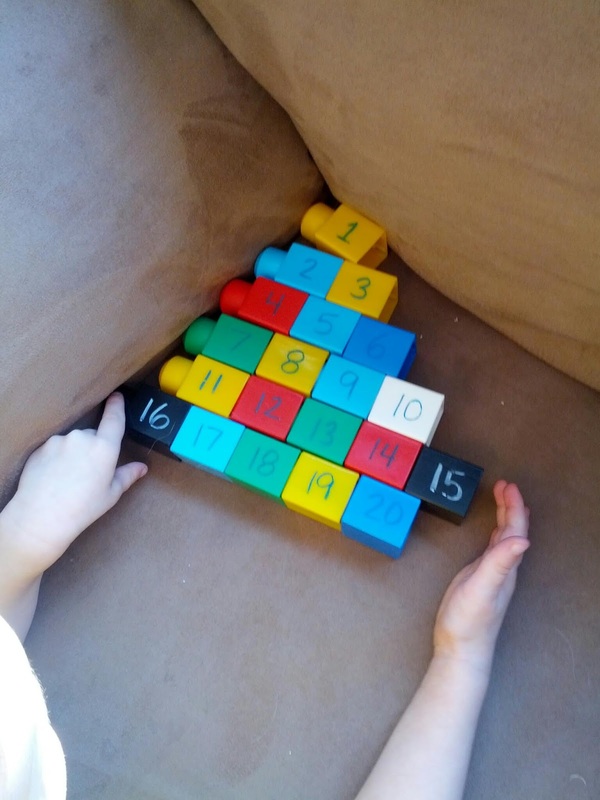 Putting the numbers in order. J working his way up to 20. Now that the blocks are in order, you can practice counting them. J could easily spend hours a day just grouping numbers to form patterns so that is what he ended up doing with these blocks. I was curious what he had planned. It turns out that he was planning to build a pyramid. Then he stood the pyramid up. 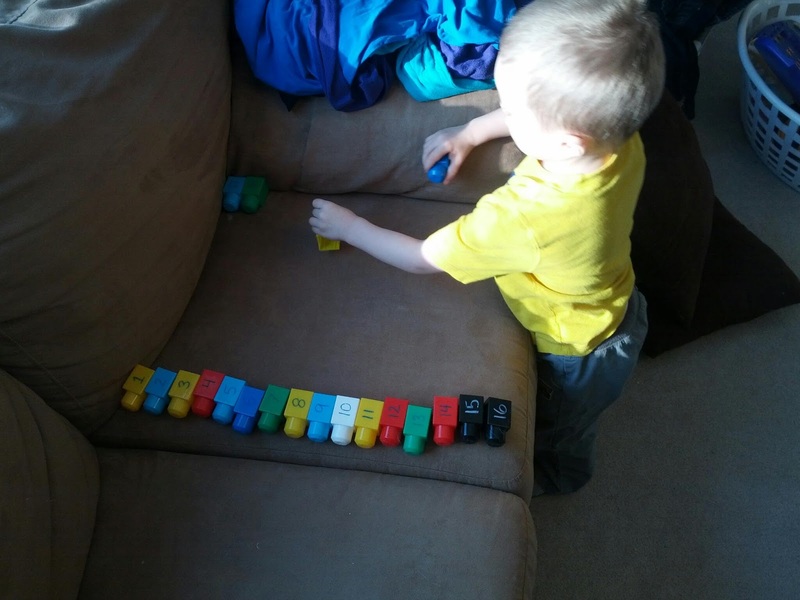 Which lead to him organizing his blocks as follows. Of course he leans his head in when I was trying to take a picture. Regardless, look at that organization! These number blocks were a huge success with J. 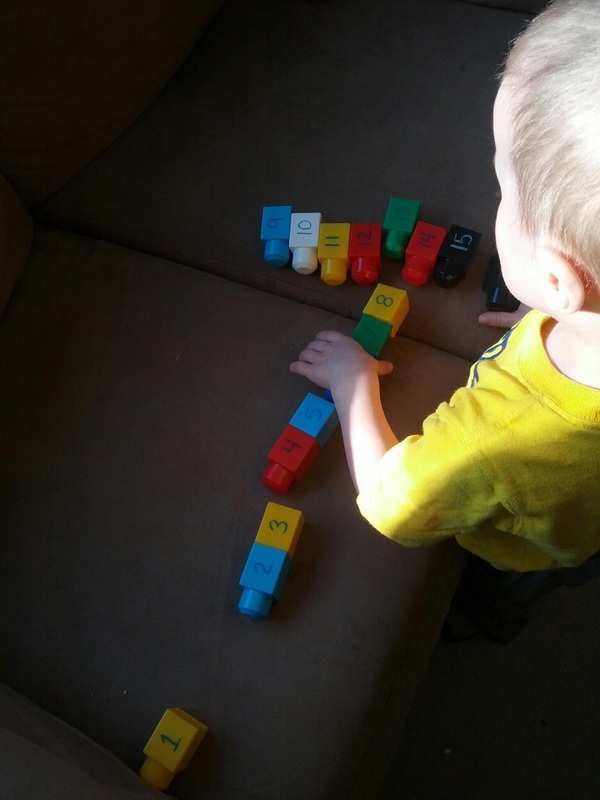 He ended up playing with them for quite a few days before the numbers started to rub off. He thought of the pyramid on his own? That kid's amazing! Love it! 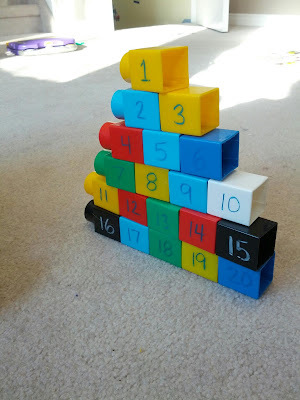 Thank you for sharing, we are definitely going to be making these over the weekend. 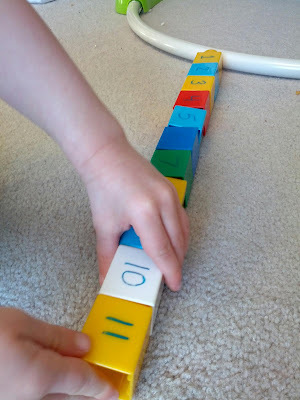 My 3-year olds love playing with the foam block version of this:http://two-much-fun.blogspot.com/2013/02/bath-math.html in the bath, so I know they'll love your block version. I pinned it. Thank you again! Thanks for stopping by. I hope your twins enjoy it as much as J did.